Don’t worry, there’s plenty of Tebow-related weirdness to go around. OUR ROUND-UP of Tim Tebow news isn’t a daily feature yet — but the way things are going, it could be very soon. Here are six weird and wonderful stories about the most divisive personality in American sports today. The hype machine has well and truly gone into overdrive. 1. #SUSPENDED Four students in a New York high school were given one-day suspensions after a spontaneous display of “Tebowing” in the school hallway. Yahoo! Prep Rally reports that up to 40 teenagers took part in a flashmob tribute to the Broncos quarterback, striking his iconic kneeling pose on their way between classes. Honouring Tebow is not against school rules; alas, blocking the hallway is. 3. #TEBREW Now you too can celebrate the wonder of Tebow while in your local hostelry on a Friday night — at least, you can if you live in Colorado. Earlier this week, the state’s Bonfire Brewing Co unveiled “Tebrew: The Sunday Sipper”, an American barleywine ale. Unfortunately, with only 150 gallons brewed, Tebrew will only be available at the brewery’s own tap room for a limited period. 4. #FATHEAD Fathead are an American company who sell giant wall decals of your favourite sporting hero. Earlier this week, the company produced its first Tebow “Tebowing” product, sparking a rush of Tebow lovers desperate to have a 4’8″ image of the NFL star watching over them always. Over $50,000 worth of Tebowing Fatheads were sold in the first two days, Business Insider reports. Cha ching. 5. #COVER STORY Unless you’re a serial cover star like Michael Jordan (49 times), appearing on the cover of Sports Illustrated is generally considered a pretty prestigious honour. No biggie for Tebow, he’s splashed across the front of the magazine for the second time in the space of four weeks. Now, can he avoid the infamous SI cover jinx against the Patriots on Sunday? 6. #MIC’D UP And last but not least, if you haven’t seen this yet, you might enjoy it. It’s footage from the Broncos’ thrilling overtime victory against the Chicago Bears last weekend with added audio of a mic’d-up Tebow messing about for three quarters, praying a bit and then marching his team to another late, late win. 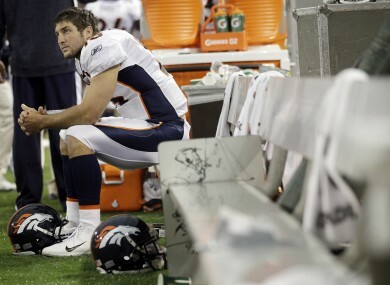 The Redzone: Will the Brady Bunch have time to stop the Tebow tide? Email “Tebow Time: 6 great Tim Tebow stories you may have missed today”. Feedback on “Tebow Time: 6 great Tim Tebow stories you may have missed today”.